Jason’s Deli makes a very creative chicken salad. It is simple but appetizing, and you can recreate this copycat recipe at home. Do you like chicken salad, but think it can be complicated to make? If you are like me, I wonder what should I put in there, pickles, onions, olives, other crunchy edibles. I recently tried Jason’s Deli Chicken salad and was blown away with the sweet simplicity of this recipe. It contains mayonnaise, slivered almonds, chicken, salt, pepper, and crushed pineapple. Do you wonder how this tastes? Let me tell you, it is amazing. It is slightly sweet, and the almonds give it the perfect crunch to this recipe. For years, I have seen it served there, and honestly I like their soups, and their Reuben that I never got around to this delicacy. At my local Jason’s Deli, you can get it served on a bed of lettuce and with some fresh fruit. Of course, you can get this salad in a sandwich, they are a deli. What I really liked about this recipe is that you can make the chicken salad ahead of time and enjoy it a few days later. This is the perfect salad to bring to work. I love being able to save money when I brown bag it to work. 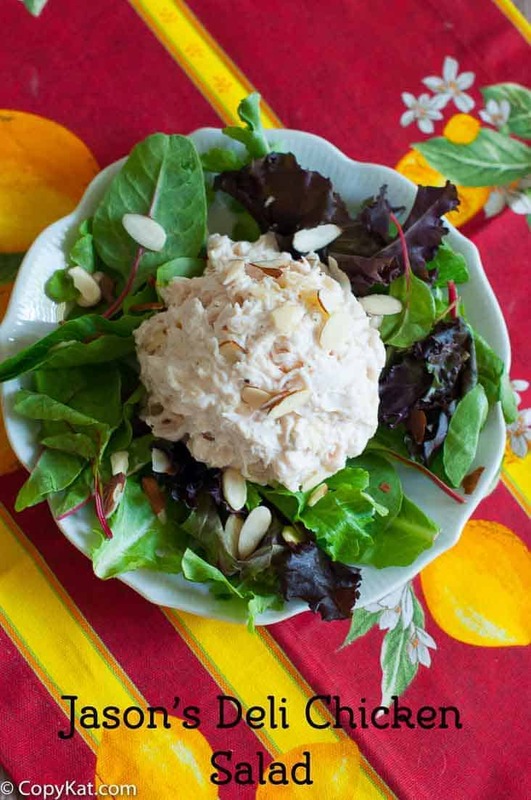 You can serve this chicken salad alone, with crackers, on a sandwich, or you could get fancy and stuff it inside of cream puff shells for a party. I bet you will enjoy this delicious simply made chicken salad. Do you love Jason’s Deli? Check out the Jason’s Deli Chicken Pot Pie. 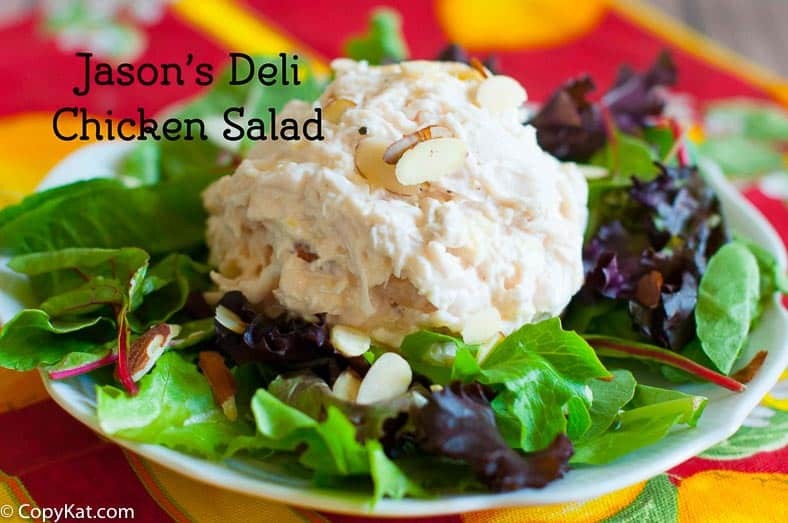 Enjoy Jason's Deli Chicken Salad when you make it at home. Shred chicken into fine pieces. In a medium sized bowl combine chicken, crushed pineapple, mayonnaise, almond slivers, salt, and pepper. Stir until mixture is uniform. Cover and refrigerate for 1 hour before serving. This stays fresh for 2 to 3 days in the refrigerator.If you do not want to drain your pineapple you don't need to, but you will need to reduce the amount of mayonnaise by at least a tablespoon. I recently had Jason’s Chicken Salad, and it was made with red grapes instead of pineapple. I will have to go in and check it out thanks. I did go back and check, they still made it with pineapple, no grapes at my location. I’m going to try this recipe, but I would love to have a copycat recipe for Great Harvest Bread Company Chicken Salad. hope you enjoy this recipe, I will take a look at the Great Harvest Bread Company Chicken Salad! This is oddly satisfying! It is sooo delicious! I would have never though to incorporate pineapple in my chicken salad. Thank you!! Wow!! Soooooo good!! ???? This IS the recipe! I received the exact same recipe from a friend who used to be a GM at Jason’s. I use Miracle Whip, and sometimes toss in a handful of dried cranberries. Oh wow, how about that. Glad you liked the recipe. This didn’t taste anything like Jason Deli’s chicken salad.